Human beings especially athletes need a good supply of oxygen while carrying out training or exercising to gain useful energy via the cellular respiration process. However, due to surrounding environmental pollution and degradation, inadequate ventilation, exertion or nervous tension, many people do not get the necessary oxygen for their bodies. Oxygen therapy has been known to give athletes that extra spurt and energy in their training for superior performance and a competitive edge over their competitors. There is a similar device in the market to help ordinary users train longer and harder. 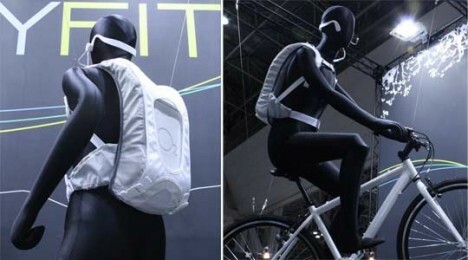 Oxyfit is the world’s first personal compact oxygen supply that can be can be worn by users in activities such as running and cycling to boost oxygen supply to the body. It consists of an advanced electronic oxygen generation pack, an oxygen tube, an aspirator, and a lithium-ion battery. The tube snakes in front of the face and channels oxygen directly from the backpack. It can increase oxygen intake by up to 30 percent. Increased oxygen flow to the body also improves metabolic rates, builds muscles, and helps in weight loss. However, carrying a 1500 g backpack while doing physical activities may weigh down and inhibit the ordinary sports enthusiast too much to be ideal for all activities.